Welcome to Kerridge! This delightful hamlet is located on the side of Kerridge hill overlooking Bollington and is itself overlooked by White Nancy. There is a strong association of householders, the Kerridge Residents Association. 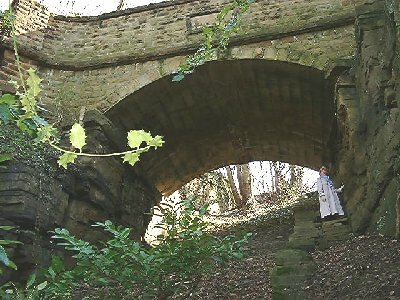 Some of the history of Kerridge is on other pages – extractive industries; Kerridge Wharf and Stone Saw Mill. Higher Lane leads up to a row of beautiful stone cottages which have wonderful views out over the Cheshire plain (right). Their gardens are a picture, built amongst stone walls and steps. There are many footpaths in this area. The one shown right leads down the field to the right of the farm below. 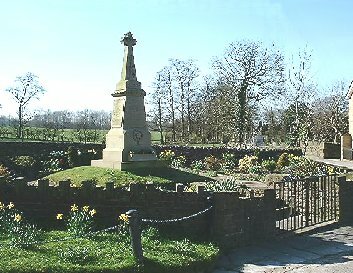 The War Memorial is maintained by the Kerridge War Memorial Committee using only public subscriptions. It is always immaculate and colourful. It is located on Oak Lane at the crossing with the Rally Road (railway road) which was once a tramway from the quarries to the canal wharf. Victoria Bridge carries Windmill Lane over the course of the inclined tramway. A steam engine at the top was used to lower wagon loads of stone from the quarries down to the Rally Road below. 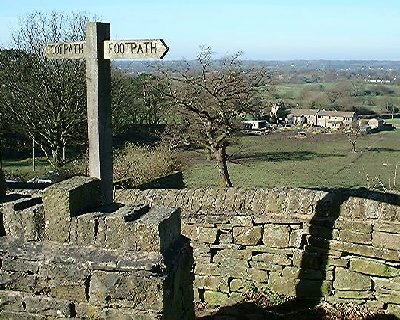 Kerridge stands above Bollington on the western side of Kerridge Hill which is the local landmark. White Nancy stands on the north end of the hill immediately above Kerridge. The small town of Bollington is located about three miles north of Macclesfield, 18 miles south east of Manchester, in north east Cheshire, in the north west of England. It nestles in the western most foothills of the Pennine range of hills above the Cheshire plain, adjacent to the Peak District National Park. 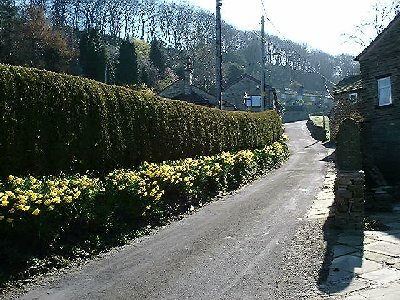 Kerridge is a hamlet that owes its existence to the quarrying industry which continues to this day in the hill behind, though nowadays on a much reduced scale. There was once a coal mine in the hill too. 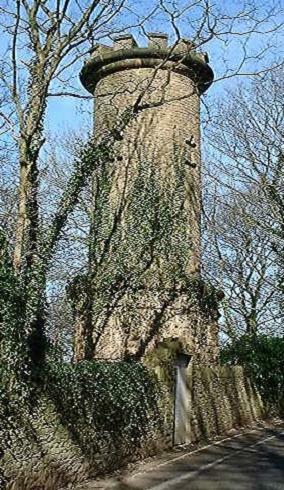 Clayton’s Tower, beside Windmill Lane, appears to have been a chimney top for a furnace lower down the hill, although inspection in 2009 showed no sign of soot. The tower was cleaned and minor problems repaired in April 2010 (pictured below left) as a part of the KRIV project . 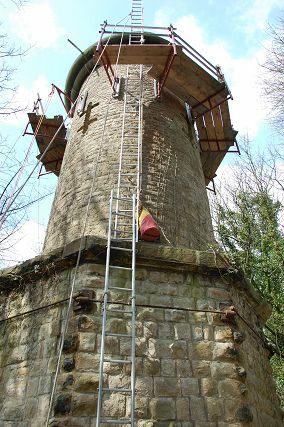 The work was carried out by Bollington’s Bailey Steeplejacks who provide this kind of service around the world. The opening of the Macclesfield Canal in 1831 provided important development incentive for the whole area. Probably the best known son of Kerridge is Alfred Gatley, 1816-1863, who was a noted sculptor and who spent much of his professional life in Rome. Elsewhere on this website we include the fascinating memoirs of Enid Simpson of Kerridge, “A Kerridge Childhood“. A bit of history! Read about Kerridge Bantams football team, 1900.